The Dark Decadence 7 rig, which drilled through more than a mile of toffee, buttercream, crisped rice, and cookie crumble layers to reach the ganache deposit. 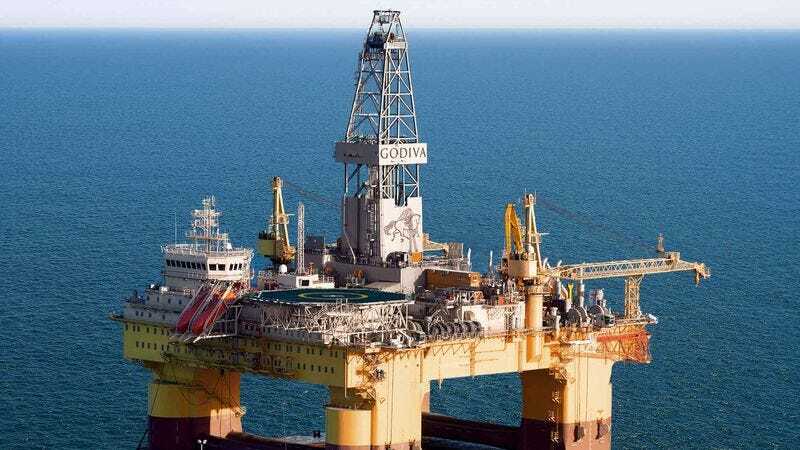 BRUSSELS—Hailing the effort as their most promising confectionary-extraction project to date, Godiva executives held a press conference Wednesday to announce that one of their deep-sea rigs had successfully tapped the world’s largest known offshore ganache deposit. According to the multinational chocolatier, its fixed platform rig Dark Decadence 7 has begun pumping ganache from deep below the ocean, having bored through the earth’s graham-cracker crust to access a 16-mile-wide undersea reservoir of the chocolaty glaze located off the coast of Belgium. Godiva miners extract chocolate chunks from a rich fudge seam, a dangerous practice that the company will begin phasing out following the tapping of the new ganache deposit. According to Godiva, the deposit contains a light, sweet ganache suitable for infusion into milk chocolate medallions and Aztec Spice truffles. Company officials confirmed that tanker trucks will transport the crude candy to an inland refinery, where it will be stripped of any lingering almond or hazelnut impurities that it may have acquired from being pumped upward through thousands of feet of compressed nougat and marzipan layers. It will then reportedly be processed to anywhere from 55 to 90 percent dark for a variety of industrial applications, ranging from cake drizzling to strawberry dipping. The finished product will be shipped to North American markets aboard a fleet of chocolate supertankers that can hold up to 84 million bonbons’ worth of ganache, company officials said, and it will reach confectioners as far east as Moscow thanks to the recently reopened Trans-Eurasian Ganache Pipeline. Champions of opening up offshore deposits to drilling have argued it reduces the dependence of Western nations on foreign ganache, much of which comes from countries that have dubious human rights records and are controlled by corrupt leaders whose ruthless regimes and lavish lifestyles are bankrolled by massive ganache wealth. Godiva, which paid a reported $15 million for its lease on the North Sea chocolate shelf, was quick to downplay criticisms of offshore drilling, a technique that carries with it the risk of deadly ganache rig explosions, as well as catastrophic icing slicks that often leave local marine life coated in thick, velvety-smooth layers of chocolate sauce. “And in the absolute worst-case scenario of a leak, we have the ability to cap our well with an airtight seal of macadamia clusters and caramel,” she added. At press time, more than 300 top scientists had signed a letter condemning Godiva and advocating for alternative sweets, such as small handfuls of fruit and an occasional dash of cinnamon.